Want to be notified of new releases in denysdovhan/robbyrussell-node? I'm developing 🚀⭐️ spaceship-zsh-theme which is an extremely powerful and customizable prompt for ZSH. It supports a lot of environments and tools to make you enjoy using it. However, there are plenty issues I faced: zsh is hard, dependency management is difficult, testing is near to impossible and so on. single code base — Single source code for all shells. The core logic is written in a high-level language while the shell-specific code is located in special files called adapters. cross-shell — different shells are too specific. Single code base on high-level language with unified interface gives us an ability to use it with any shell(fish, zsh, bash, sh, etc). 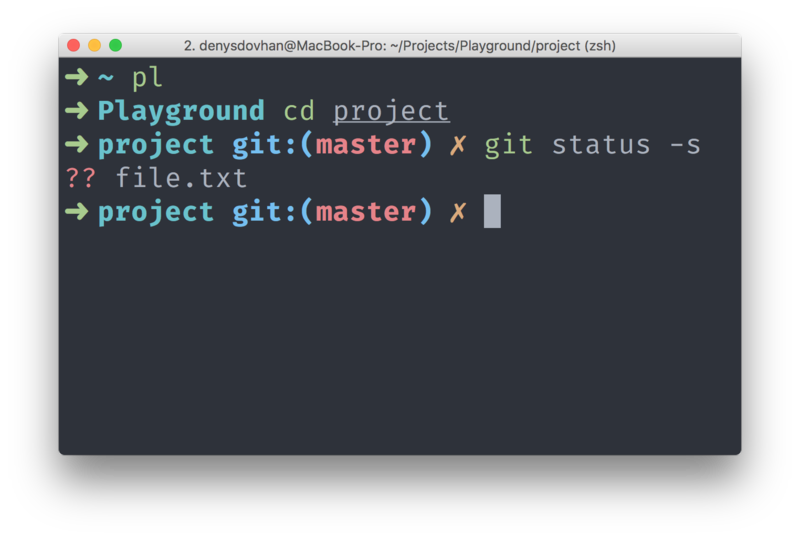 cross-platform — things like pkg allows us to package prompt into binary and use it wherever we want, even without installed language runtime. testable — high-level language and its infrastructure make it possible to test prompt components with tools like Mocha, Jest or tape (unlike traditional prompts which are usually untested). dependency management — NPM, RubyGems and PyPI store thousands of packages that could be used for special prompt's needs. It's also possible to install prompt itself with one of these package managers. asynchronous checks — the more synchronous checks you do, the slower prompt becomes. Things like async/await or Promise.all() could perform environment checks concurrently, so we can achieve significant performance improvement. Done. This command should source the corresponding adapter for your shell. Just reload your terminal. If you don't have Node.js installed on your machine, you can download pre-built binaries with built-in Node.js version. Use them in your shell configuration with adapters. function robbyrussell_fish_adapter -d "a robbyrussell theme adapter for fish"
Exposing the pormpt settings as environment variables is a known problem. This prompt reads a special configuration file from your home directory, which allows you to define more complex configs. A prompt automatically looks for ~/.prompt-config.js or ~/.prompt-config.json files. These files should export configuration object. Important: A prompt needs to escape colors codes, otherwise it would behave incorrectly. This prompt includes patched chalk package with escape codes for current process.env.SHELL.